Ravel wrote two operas, the first, described as a comédie-musicale, L'heure espagnole (The Spanish Clock) and the second, with a libretto by Colette, the imaginative L'enfant et les sortilèges (The Child and the Enchantments), in which the naughty child is punished when furniture and animals assume personalities of their own. Ravel wrote his ballet Daphnis et Chloé in response to a commission from the Russian impresario Dyagilev. The work, described as a symphonie choréographique is based on the Hellenistic pastoral novel of Longus. Ma mère l'oye (Mother Goose), originally for piano duet, was orchestrated and used for a ballet, as were the Valses nobles et sentimentales and the choreographic poem La valse. Ravel's last ballet score was the famous Boléro, a work he himself described as an orchestrated crescendo. Ravel's chamber music includes the evocative nostalgia of the Introduction and Allegro for harp, flute, clarinet and string quartet, a violin sonata with a jazz-style blues movement, a piano trio and a string quartet. Tzigane, written for the Hungarian violinist Jelly d'Arányi, is a remarkable excursion into extravagant gypsy style. 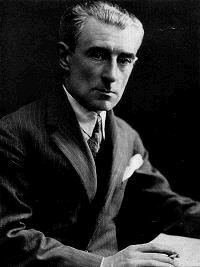 Ravel was himself a good pianist. His music for the piano includes compositions in his own nostalgic archaic style, such as the Pavane and the Menuet antique, as well as the more complex textures of pieces such as Jeux d'eau (Fountains), Miroirs and Gaspard de la nuit, with its sinister connotations. The Sonatina is in Ravel's neo-classical style and Le tombeau de Couperin is in the form of a Baroque dance suite. Composers: I.Brahms, G.Verdi, C.Gounod, S.Rachmaninoff, N.Rimsky-Korsakoff, N.Rubinstein, P.Tchaikovsky.